Wrap the uncooked bacon slice around the frankfurter by tucking the bacon into the ends, until it is tight and secure. In a frying pan over a medium flame add wrapped frankfurter and cook on all sides for a total of 15 - 20 minutes, or until bacon is cooked all the way around. Place frankfurter into bun and garnish as you desire. 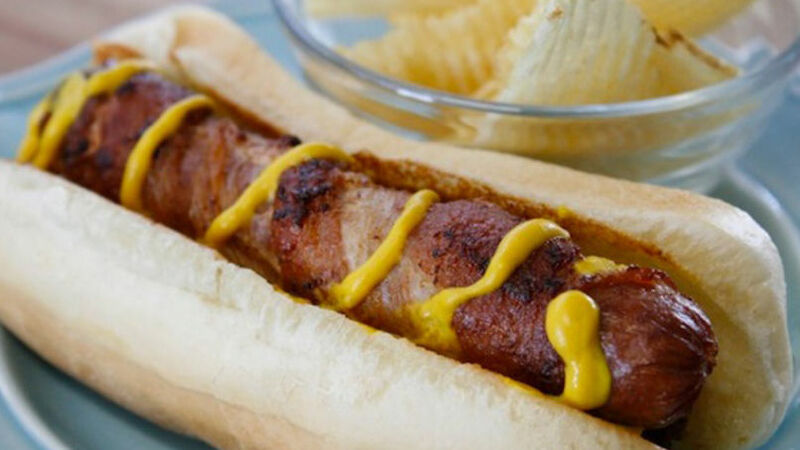 Every time for the past few years that I’ve headed to Downtown Los Angeles for shopping or business or just hanging out with friends, I almost always hit one of the hot dog vendors selling bacon-wrapped hot dogs. It’s an absolute guilty pleasure that I thoroughly enjoy and relish in whenever I can. Since I don’t always visit downtown L.A., I love the fact that these dogs are really simple to make at home! Check out this easy recipe you can make at home.